This post is part of the 31 Days with Jesus Bible study - but don't worry, you can join from today, or you can start from the beginning. Your 31 days can start any time, at any point. Just use the search bar on the right and search "31 Days" and you'll get all the posts. It starts with A Journey to Jesus. It is the strength of our relationships that determine whether or not they will last through times of difficulty. When you marry you promise to love in sickness and health, basically the good and the bad. This is the same silent promise we make in our friendships and in our relationship with Jesus. No relationship continues over a length of time without ups and downs. That is the same with our relationship with Jesus. He even warns us that things will be hard, people are going to hate you (13:13). We're now half way through this study; how is your relationship with Jesus? Are you putting the time in? Are you getting to know him and making that bond stronger? Spending time is how we strengthen that bond and in this world it needs to be strong. I am moved by the plight of Christians in Iraq, no longer just displaced but suffering atrocities too horrific to dwell upon. People are hating them, and hurting them, because of Jesus. 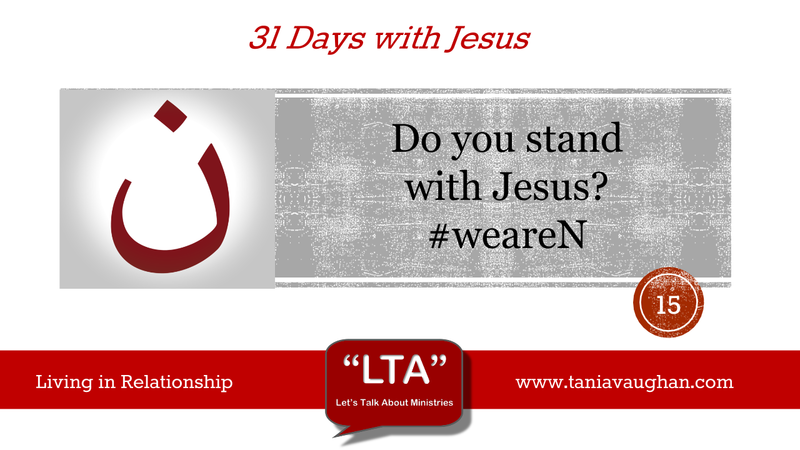 The united shout from Christians around the world is #weareN; we are Jesus' family, we are Nazarene with Jesus. I posted that same sentiment on my Facebook page. I can say that I belong to the family of Jesus, but the fact that I am not in that situation is not lost on me. Could I make the same shout if my life was in danger? Peter is challenged while Jesus is before the Sanhedrin, someone spots him "You are with the Nazarene", Peter flatly denies it as Jesus said he would, he did not shout #weareN and stand firm in his relationship with Jesus, because it put his life in danger. What did denying it do? Peter broke down and wept. When we are not secure in our relationship with God, everything feels wrong and life becomes insecure. We are made to be in that relationship and when we're not we weep. and we are crying out to you. Surely you will make this stop. Please Lord, make this stop. whether in joyful choice or desecrating hostility. Or our foot chased from its resting place. in Mosul, wider Iraq and Syria. abused, mocked, killed or taunted. who gave your life for the love of us. for the love of ‘N’ and the love of you. to those who are threatened for ‘N’ today. and through us, who must be the hands and feet for ‘N’. So many letters and labels but all loved and in need of your peace. and kingdoms rise and fall. And all we manage is to cry out to you and shakily try to make this stand. for you will be exalted and your peace will come. #weareN has become a worldwide phenomenon - to show solidarity and fellowship with others 'in relationship with Christ'. Persecuted, afraid and isolated facing thirst and hunger as well as the physical atrocity of faith crimes - could we say #weareN in those conditions? Here is chapter 14 we see the strongest of disciples - JC's rock 'the foundation on which JC's church will be built' vehemently deny #weareN 3 times - and JC knew it would be such – interesting to note what threat Peter faced to have him deny JC – A servant Girl!, yes the wider consequences could have been great but a little Girl!? We all stumble in our relationship and journey with God, it is how we grow and strengthen ready for the next challenge. But even with this rebuttal JC knew Peter's character and did not take this episode as a precursor to how useful Peter would become. God uses the weak throughout the old and new testament Moses, Gideon, Nehemiah, Jonah, David - and He can and does use me! with all my faults and failings - I’m essential to his plans for the kingdom - I just need to stand up and be #weareN where I am. Whilst my trials and tests are not as life threatening as in Iraq the enemy will test me and distract me from the task. Remember steel gets stronger and stronger with each return to the forge!